Two amazing packet tricks combined on one DVD. These are fun, visual tricks that are easy to learn! Join Paul Hallas on his DVD collection of Packet Trick Treasures! All Cards Included! Something from Nothing Amaze your audience by making Something from Nothing right before their eyes! Paul Hallas gives you step-by-step instructions on how to perform this packet trick, along with a few secrets that will leave your audience astonished! 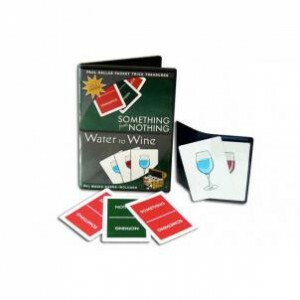 Water to Wine Have your audience thirsting for more with this Water to Wine packet trick. Paul Hallas will teach you step-by-step how to perform this packet trick, along with a few comical puns that will leave you audience astonished and laughing!